Glorious meatballs, bathing in hearty, simmering sauce, can be found all over the world. Some meatballs are a meal unto themselves, requiring a knife and fork, while others are delicate, dainty droplets – more garnish than substance. Although most people enjoy a good meatball, entirely too much effort goes into making them. Intended to be comfort food, even homemade street-food, meatballs should not be an all day affair. Here are my simple tips for how to make great meatballs, from any country. 1. Roast the meatballs, don’t fry them. I’ve ruined at least 4 cute shirts by pan-frying batch, after batch of meatballs. Oil spatters not only ruin shirts, but also burn skin, grease up the stove top, and yellow surrounding walls. Not to mention the time it takes to carefully rotate each meatball. One. By. One. Usually, the little balls get beat up in the process and end up with flat sides, like the skulls of babies who aren’t given enough tummy time. To roast meatballs, all you have to do is lay them on an oiled baking sheet and pop them in the 425F oven for about 20 minutes, or until cooked through. Instead of hovering over a hot, greasy pan, you can walk away and do something else! 2. When trying a new recipe, test the meatballs before cooking them all. No point making an entire batch of meatballs only to find out they need more salt. Or garlic. Or cayenne. Or worse yet, there’s too much seasoning. Take a small pinch of the meat mixture, cook it, and taste it. Better this than having to throw out the entire batch and start again. If the meat needs more seasoning, great – go for it. If the meat has too much? You have two options: send someone down to the market to pick up more ground meat to “water down” the seasoning, or add some more breadcrumbs. Adding more breadcrumbs is not as desirable – or effective, but will work take the edge off in a pinch. 3. Always make the sauce after making the meatballs. Let’s just say you made your meatballs too spicy or salty and don’t have enough ground meat to fix the problem. If you wait to make your sauce until after cooking the meatballs, you can tone down the sauce to help fix the problem. – Mild sauce compliments spicy meatballs. – Spicy sauce compliments plain meatballs. 4. Make your meatballs a day ahead. Take a tip from the Azerbaijani and make your meatballs ahead of time. Think of the herbs, spices, meat, and sauces as strangers at a party. They need time to mingle and get acquainted before they really cut loose! Mix up the meat with the seasoning and let sit, refrigerated over night. In the morning the chilled mixture will be easier to shape… or you can shape the meatballs ahead of time – store them on the baking sheet in the refrigerator, and just perk them up the next day, right before baking. You can literally season meatballs to go with food from any part of the globe. Just look at Wikipedia for a dizzying list of meatballs from around the world. Frederick F would love to read this as his meatballs are famous…remember? I wonder if he roasts? the italian style i make i usually fry. they are great. i tried the same recipe and baking last time and it tasted fine, but they had waaaaaay to much liquid come out of them and into the sheet pan. it was kind of gross to see and deal with. i obviously need to adjust the recipe somehow if i bake them but i have not figured out how to do so. i’ll see. I wonder if this was due to the fat content of the meat? We had some “oozing” on the sheet tray but for we just scooped them up, placed them in a casserole with the sauce and they were perfect. I have never considered roasting meatballs–I’m definitely going to try that next time. Thanks for the tip! Report back how it went! I think the making a day ahead refers to seasoning and letting them sit overnight and not cooking them. Once cooked, the flavors will be fairly set – all the collagens cross-linked and all. Love the roasting – do it all the time – healthier too! Also, a hint, you can tuck all sorts of things INTO meatballs. Iranians like to put eggs or nuts and fruit. My favorite is to tuck some sour cherries inside and then top the cooked meatballs with a sour cherry sauce – Uzbek style – yum! I tried making the meatballs ahead, but not cooking until the day of. They were wonderful and I fixed my post to indicate this approach. I would think cooking ahead works better with soups, stews, curries, and chilis. I like to brown meatballs under broiler first which eliminates the mess of browing in fry pan and also drains some of the grease that may be in the hamburg. 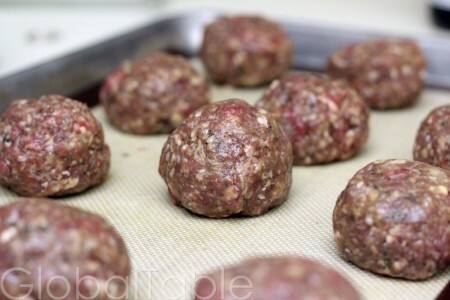 I like meatballs to be tiny bit browned/crisp on outside and then finish cooking in oven or simmering in sauce. I prefer to finish cooking in sauce. I especially love the sweet & sour sauce recipe I have. Hamburgs on a grill you may want a bit more fat in with the meat.